I’ve always been a creature of the night. I like being awake until the early hours and, when I was a teenager, my dad used to get extremely mad at me because I enjoyed my afternoon naps when the sun was out, so I could stay awake at night, reading, writing or watching movies. I’m not averse of daylight, in fact I really enjoy the sunshine, but my favourite part of the day is when the stars and the moon are out. I think I particularly enjoy that part of the day when it’s getting dark but it’s not entirely dark yet. Everything is washed by this magnificent blue, like a dark royal blue, and the whole world just looks so beautiful. You have to be careful to catch it, though, as this bit of the day usually goes quite fast. I’ve been meaning to do something about our corridor wall for a while now. However, same as with writing, it takes time to find the inspiration to do stuff like that. I used to look at the wall every single day and imagine some possibilities for it, but never felt completely ready to actually do something. Until yesterday. Yesterday, starting at my favourite time of the day, I got all my pictures, bits of art in postcards and cuttings that I had and went for it. Now, don’t get me wrong, I’m not an artist or anything like that, but I do enjoy putting things together. I like colours, I like compositions and I like the effect of some things when they are next to each other. 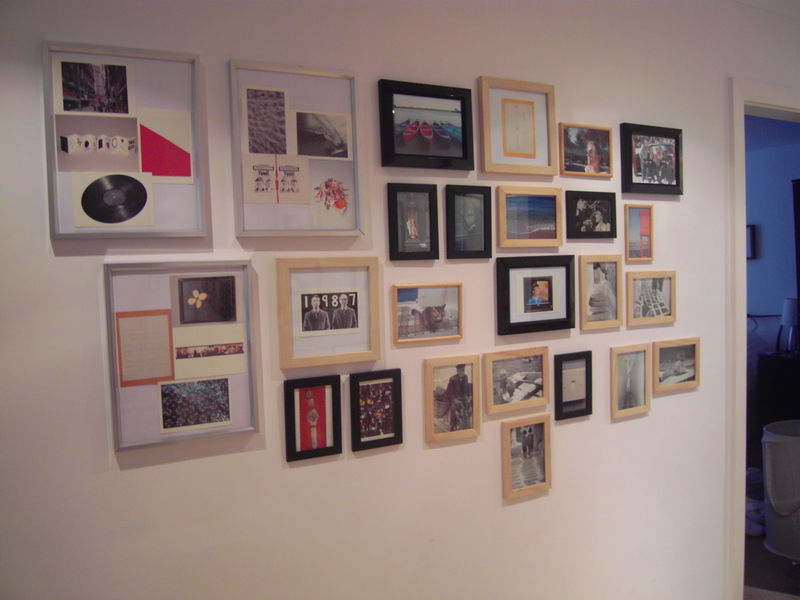 So last night I got all my frames, my pictures, scissors, paper and imagination and started my wall project. It took a while. I don’t normally do a composition on the floor, like maybe you should at first and then hang it all on the wall. I hammer the first picture up and then the rest kind of flows from there.I don’t know what the correct way of doing this is, but I’m not sure this matters, really. I was very pleased in the end. It’s probably nothing too special, but it is a quite accurate translation of what was in my head, which is why it is already so special to me. I love it! Lee loves it too (thank God, since he had no input in this one!). I guess what I’m trying to say is that creativity is something you can’t force. Sometimes it just comes to you and you feel so totally compelled to do something with it that things just happen in their own way. I could have tried to do this ages ago, but I’m sure that the result wouldn’t have been half as good as yesterday’s. I am pleased to look at it, especially because every single picture has a meaning to me. The wall is below. I hope you like it too. The worst part of moving house is to decide what to take/get rid of/give to charity/fix. It’s a long process and, in many occasions, it brings up quite a diverse array of emotions. If you haven’t read in one of the previous posts, my boyfriend and I are moving from a house that we share with two friends to a 2-bed flat where it’ll be just the two of us (“Just the two of us… we can make it if we try…!”) haha! The thing is that we are moving into a smaller place. For example, in the house where we are now, we have a massive cellar where we can basically dump anything that we want to keep or anything that we are not quite ready to get rif of… just yet. It’s now the time to go to that cellar and go through boxes and more boxes to decide what we should take to our new life. And oh dear, what a torture this is. I get easily attached to certain things. Most of them don’t have any monetary value, but the sentimental one goes well beyond the scale. And my problem is that I tend to put a sentimental value into everything that I own, so getting rid of something is a monster decision that can even mean tears. Ok, ok, I’m a big drama queen, I know, but I can’t help it! Clothes, for example. I’ve gone through my wardrobe about 3 times so far since we decided to move, and in these 3 times, I only managed to get rid of a couple of items. It’s almost a joke. Of course, there are pieces I haven’t worn in a very long time, but amazingly for someone with a bad memory like mine, I remember when I wore some things last and remember that I was with a friend having a good time, or on a trip to some nice place, etc… and then the item goes right back where it came from… just because it made me smile again. Clothes are hard to dispose of but, when I went through my notebooks, the attachment I create with things went up a whole level. I simply think everything is important. I see a sentence I wrote somewhere and think: “Ah, this might become a blog post one day…” or “I remember when I wrote this…” and then the result? Yes, you guessed: nothing goes. Instead, I spend hours and hours looking at things and never throw anything away because of what I now call my “nostalgic addiction”. Ahhh! It’s been hard so far, but today, however, I woke up determined. I decided to tackle this task as if I was a professional organiser of houses and nothing really belonged to me. I tried to see it all from above (this is something I like to do when I can’t find a way out of a situation). And so I spent my day filling in the bin and bags for charity with all the stuff that no longer is part of my present. It wasn’t easy, it wasn’t easy at all, and now that the task is (nearly) completed, I feel happy for being brave and dettaching myself off things that no longer belong in my life. If it was worth it, it will stay in my memory. Of course I won’t get rid of everything, as some things are far too important to me, but it’s important to be able to differentiate the important ones to the ones that are pure physical and mental clutter. And this is what my Sunday was like. Full of emotion, a few tears and some moments where I had an item in my hand, going to the bin and then, almost ready to drop it there, I’d take it back for a final look. Very dramatic, me. Dettaching yourself off things is a relief and makes our lives free for new memories. It can be a bit of a painful process, but very necessary, especially when the present is so beautiful and the future is right there, smiling at me.